Portrait of Lady Hester Catherine de Burgh, later Lady Sligo. 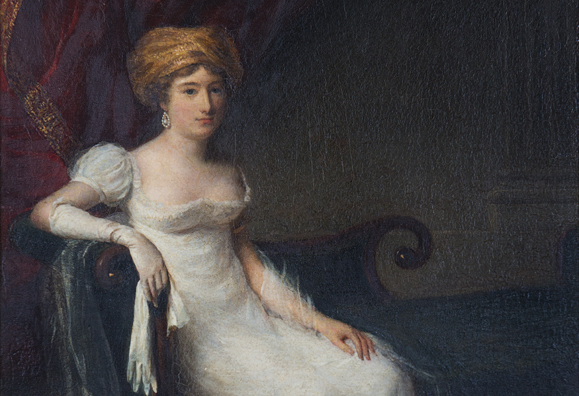 Ireland’s Great Hunger Institute at Quinnipiac University in Hamden, CT recently acquired the historically significant collection of Hester Catherine de Burgh, Lady Sligo (1800-1878). The letters and other related artifacts will be on display at the institute’s inaugural exhibition, titled “Lady Sligo Letters,” which opens to the public April 29. Lady Hester Catherine de Burgh was born into Anglo-Irish privilege, and in 1816 she married the Marquess of Sligo, owner of Westport House, becoming Lady Sligo. But in the1840s her husband suffered a debilitating stroke and Lady Sligo took over the day-to-day management of the estate. Her letters from the period demonstrate a keen awareness of contemporary politics and her concern for the poor, especially as the Famine unfolded, while providing unique insights into Irish society in the mid-nineteenth century. Some of the topics she discussed in the letters were the Great Hunger in County Mayo, a badly affected region; the role and influence of women in Irish society; the diverse response of Big Houses to poor tenants during a period of crisis; and the social and political difficulties faced by humane landlords. The exhibition will be on display in the Lender Special Collection Room of the Arnold Bernhard Library at Quinnipiac, a venue built in the form of a ship’s hull to commemorate the mass emigration occasioned by the Great Hunger. Wonderful humanitarian commentator, for our awareness!